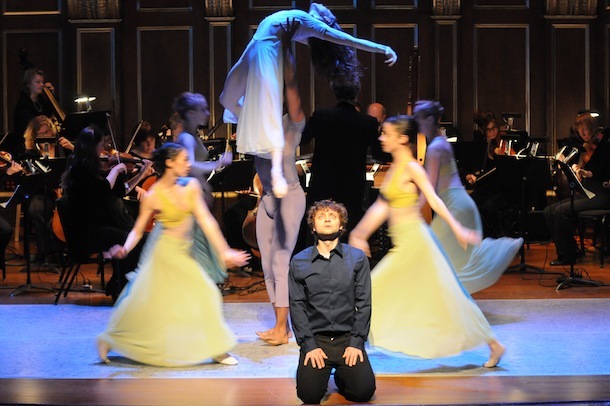 Owen Willetts sings and suffers in Orfeo ed Euridice. Over the past few years, Martin Pearlman's Boston Baroque has developed its own rather unique approach to baroque opera. Usually working in the same constrained space (Jordan Hall) as the more historically-minded Boston Early Music Festival, Boston Baroque has pursued an intriguing amalgam of the modern and the period; generally this has meant modern costume and dance, coupled with "originalist" instruments and vocals. This contrast might bother a purist, I suppose; but Pearlman has usually turned to choreographers, such as Marjorie Folkman (late of the Mark Morris Dance Group), with a natural sympathy for baroque style and form. For Gluck's Orfeo ed Euridice, however, (which closed last weekend), Pearlman went instead with dancemaker Gianni Di Marco, whose work is less historically minded than Folkman's, but also larger in vision and (I'd argue) dramatically responsive, even inspired - it mapped beautifully to David Gateley's subtle stage direction, making this perhaps the most aesthetically coherent opera production I've yet seen from Pearlman's group. This would have been good news enough, but the production had another secret weapon - the Boston (and, I think, American) debut of British countertenor Owen Willetts, who has been a big noise in Europe for some time, and practically shook the rafters at Jordan Hall with what amounted to a mezzo of stunning, indeed almost clarion, power. At times you can feel that Willetts is turning inward to focus entirely on exactly how he's producing a voice this size - indeed, his thin frame seems to almost tense with every aria; but actually, this often helped with a dramatic performance that was appropriately intense and stricken, and you didn't mind the occasional "gap" in his acting because his vocals were so transfixing. Willett's voice doesn't boast just size, but also a rich, deep color that's rare in countertenors, and which as the grieving Orfeo he tinged with a melting poignancy. Willetts is truly something to hear, and let's hope we hear him again soon. His only real vocal competition (at least in terms of sheer force) was the chorus, actually - which sang with beautiful focus and an eloquent attack, btw (and was imaginatively blocked by director Gateley). But for the record, local favorite Mary Wilson proved a luminous Euridice - whose second death was quite heartbreaking - and soprano Courtney Huffman made a delightfully nimble and boyish "Amor" (who in this version revives Euridice at the finale, just because otherwise the story is way too sad!). For the opera buff, the production was intriguing in yet another way - Pearlman had returned to Gluck's original version, in Italian, which was stripped of much of the ballet music which encrusted it in its later, French incarnation. The results were, indeed, pleasingly swift and dramatically focused - with my favorite sequence, the chorus's rebuke of Orfeo at the gates of Hell, here a particular delight. But there's still a lot of dance even in the original, so it was good to have Di Marco on board; his evocation of the Elysian Fields was especially lyrical and moving, and several scenes featured exceptional work from leading lady Ruth Bronwen Whitney. Later, as Orfeo and Euridice creep up from Hades, Di Marco conjured an even more inspired pas de deux which developed cleverly from the requirement that the two lovers never meet each other's gaze; here the haunted, uncomprehending Whitney was sensitively supported by partner Henoch Spinola. So - to recap: this production included some of the best singing and definitely the best dancing and staging we've yet seen at Boston Baroque; but how was the orchestra? Pretty damn fine too - although the horns scraped alarmingly in the opening sections, they seemed to quickly right themselves, and the rest of the orchestra was transporting, particularly harpist Barbara Peschl-Edrich, who on a tricky period harp evoked Orfeo's lyre with an exquisite delicacy. Altogether, this was quite the night to remember at Boston Baroque. I'm not sure how they'll top it, but here's hoping they do.